EUR/USD falls to 3-month low on weak Eurozone economic growth and interest rate differentials -- EUR/USD fell to a 3-month low on Monday, extending the sell-off seen in the past two weeks. EUR/USD has weakened, and the dollar index has rallied, since Jan 30 when the Fed surprised the markets with its move to a fully-neutral monetary policy. A dovish turn in Fed policy would normally be bearish for the dollar but the move in this case was bullish for the dollar because it kicked off a string of dovish turns by other central banks that are seeing the same weak global forces being seen by the Fed. The dollar also has some underlying support because even though the Fed has paused its rate-hike regime, the Fed is still steadily tightening liquidity with its balance sheet reduction program. The euro is seeing particular weakness because of a string of weak Eurozone economic data that makes it unlikely that the ECB will be able to raise interest rates this year. Italy is in a technical recession with small GDP declines in Q3 and Q4 and Germany is expected to barely skirt a technical recession with a small +0.1% q/q gain Q4 GDP after the -0.2% q/q decline seen in Q3. 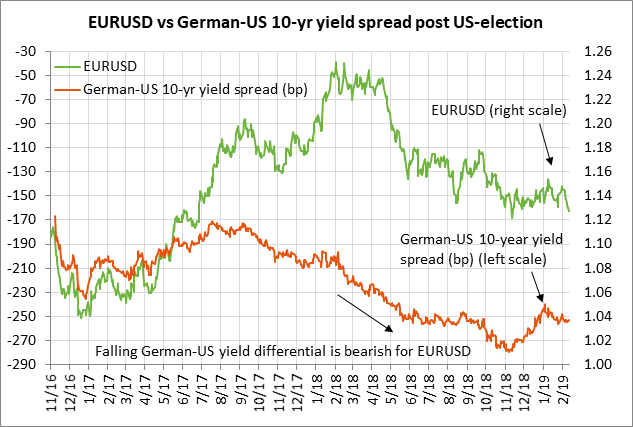 The euro is also being undercut by poor interest rate differentials. The 10-year German bund yield last Friday fell to a 2-1/4 year low of 0.08% before rebounding to 0.12% on Monday. The 10-year T-note yield, by contrast, is consolidating near 2.65% and is trading far above the bund yield. 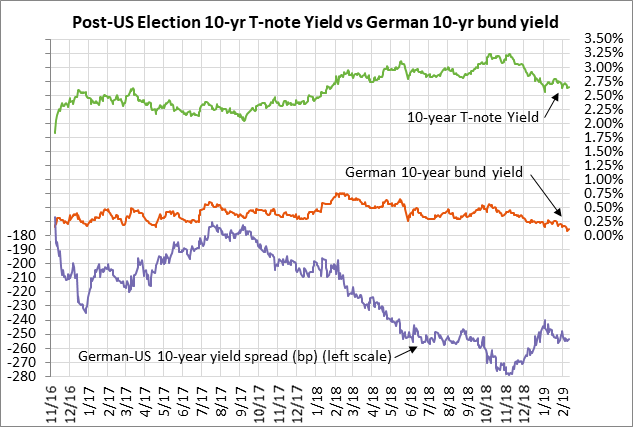 The 10-year bund is trading at a -253 bp discount to the 10-year T-note yield, a steeply negative interest rate differential though it is at least better than last November's record low of -279 bp. Possible Trump/Xi summit in March would suggest tariff deadline extension -- Trump advisors are discussing the possibility of a Trump/Xi summit in March, according to an Axios report late Sunday and White House Advisor Kellyanne Conway on Monday. 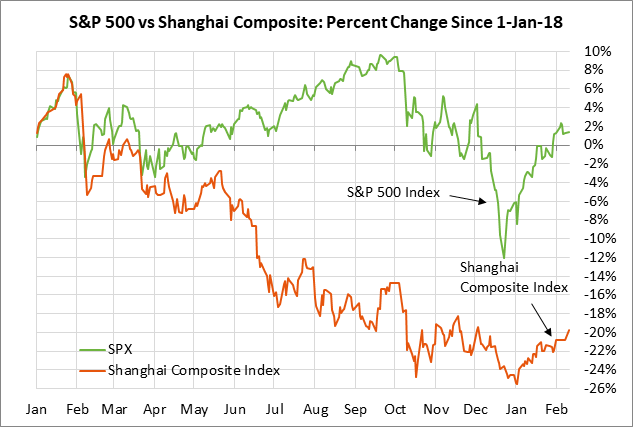 The markets are hoping that any Trump/Xi meeting would be to announce victory on a new US/Chinese trade deal as opposed to another negotiating session. The White House talk about a March Trump/Xi summit suggested that the administration still hopes for a final deal in March, which would necessitate an extension of the March 1 tariff-hike deadline. The odds for a deal depend heavily on US/Chinese trade talks this Thursday and Friday in Beijing. USTR Lighthizer and Treasury Secretary Mnuchin along with their working team arrived in China on Monday to hold preparatory meetings for the formal talks later this week. Congress tries to work through border security snag -- Congressional negotiators are still working on a deal involving upwards of $2 billion of border security funding. While the two sides are engaging in some last-minute brinkmanship, the odds still seem good for a deal since neither the Republicans nor Democrats want another government shutdown on Friday night when the CR expires. Even if there is a Congressional deal, the question then becomes whether President Trump will sign that deal. If not, then there will either be a government shutdown on Friday night, or Mr. Trump might allow the government to say open with a new funding bill but go ahead with his threat to declare a national emergency on border security. If Congress needs more time to work on a border security compromise, then there is also the possibility of a short-term CR extension. The markets mainly just want the U.S. government to stay open so that there are no new economic disruptions. U.S. job openings expected to remain generally strong -- The consensus is for today's Dec JOLTS job openings report to show a -42,000 decline to 6.846 million, adding to November's -243,000 decline to 6.888 million. The JOLTs report is down by 405,000 jobs from the record high of 7.293 million jobs seen in August 2018, but remains in generally strong shape and is above the 12-month trend average of 6.7 million jobs. 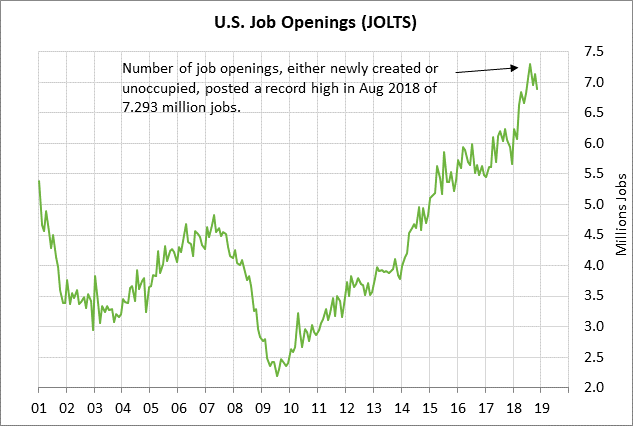 The general strength in the JOLTS report is good news for the U.S. job picture since many job openings turn into actual job hires once the hiring process is complete. The markets were impressed by the recent Jan payroll report of +304,000, which was stronger than expected and showed strong hiring despite the bad news of the Q4 stock market correction and the Dec/Jan U.S. government shutdown. Payrolls over the last six months have shown an average monthly gain of a strong +232,000. Prime Minister May makes a Brexit statement today as no-deal Brexit odds rise -- Prime Minister May will make a statement on Brexit today rather than on Wednesday. Ms. May today is likely to announce a delay of the Brexit vote that had previously been expected on Thursday. Ms. May will likely say that she needs more time to negotiate with the EU on the Irish backstop before she comes back to Parliament with a revised Brexit separation agreement. Ms. May today may also promise that Parliament will have opportunities within the next few weeks to vote on alternatives to a Brexit agreement such as a delay in the March 29 deadline. The betting odds for a no-deal Brexit have now risen to 7/4 (37% probability) from 25% a few weeks ago, according to oddschecker.com. Those higher odds have helped drive sterling lower in the past few weeks. 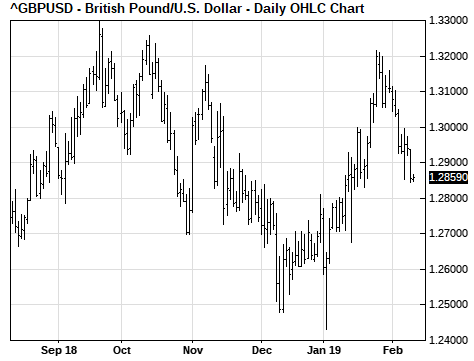 GBP/USD has fallen fairly sharply to a 3-week low since Parliament on Jan 29 overwhelmingly defeated Ms. May's Brexit separation bill. The prevailing market view at this point is that Ms. May will be unable to get Parliament to vote in favor of an EU-approved Brexit separation bill but that a no-deal Brexit will be avoided by an extension of the March 29 Brexit date to give the two sides more time to try to come up with a deal.